it's so sad that we get to see children at night on some areas. you get to see some of them selling things, flowers and food. in this picture i encountered five kids along the road. two are sleeping and three are awake begging and it was already 11:35pm. one kid was holding a balloon while the other one was eating junk food while the small one was looking at me wondering why i was taking picture. i don't actually see them during the day, which means they either go to school or the worst working to make a living. 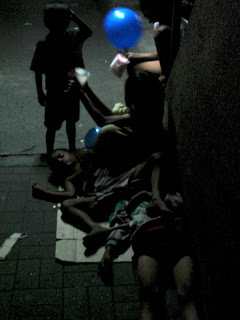 let's think of ways to reach out the poor especially like the ones we see along the streets. spend some time with them and you'll appreciate life more. you'll learn many things. strong people, living day to day with no food. and they never curse, never complain. We don't have to give them pity or sympathy. We have so much to learn from them." je suis touchée par cette photo, elle rend le monde laid et insensible.Des enfants si jeunes, si désespérément seuls......à douter de nos sociétés dites "civilisées"
merci beaucoup!je parle tres oeu le francais. quel est votre nom? Je m'appelle Arièle et j'habite la Bretagne dans l'ouest de la France. Je suis déçue de ne pas lire l'anglais comme il faut car vos commentaires ont l'air très intéressants. Vos photos le sont aussi, elles ne sont pas mièvres, elles montrent le monde tel qu'il est, avec de l'humour aussi. A bientôt de vous lire j'espère. salut ariele. tu as quel age? avez vouz website? et ma nièce au Mexique aussi. Ce qui est drôle, c'est qu'en fin de compte on se renvoit chacun de son côté l'image de "l'exotisme". this is inspiring for us to be generous to others and not waste what we have in so much abundance that we tend to be ungrateful of them. a lot of people also needed those blessings that we have, we must treasure them and share them to others.